Toronto, “The Queen City,” has many attractions for its citizens as well as for the thousands of tourists and others who visit it each year. It occupies a fine site by the shores of Lake Ontario, has beautiful residential areas and public parks, many handsome financial and industrial buildings, a good transportation system and a wide range of high-class retail stores, equal to the best found anywhere. It has an abundant supply of cheap hydro-electric power and natural gas and a large airport with worldwide connections. It is also a centre of cultural life with its churches, University, colleges, museum, art gallery, Conservatory of Music and technical schools. Its social service organizations receive generous support of the citizens each year. 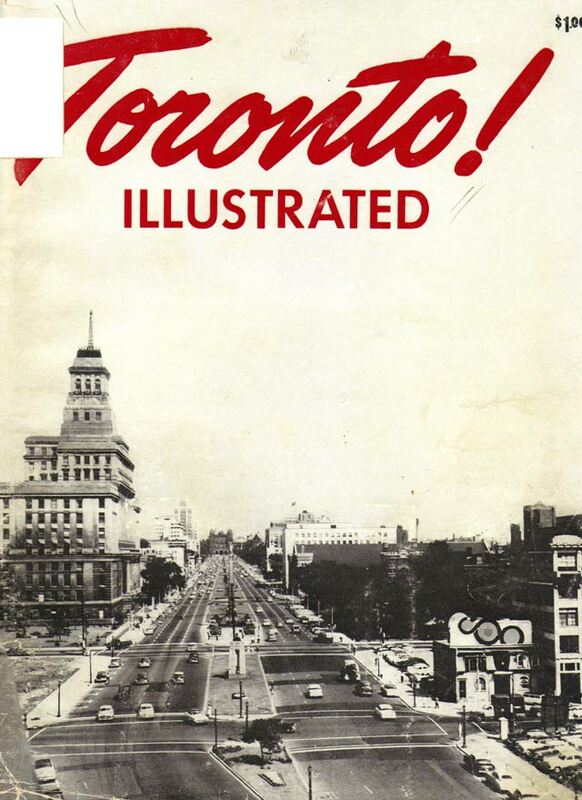 With those words, editor James Cowan introduced the 1957 edition of Toronto Illustrated, an annual guide for visiting businesspeople and tourists. 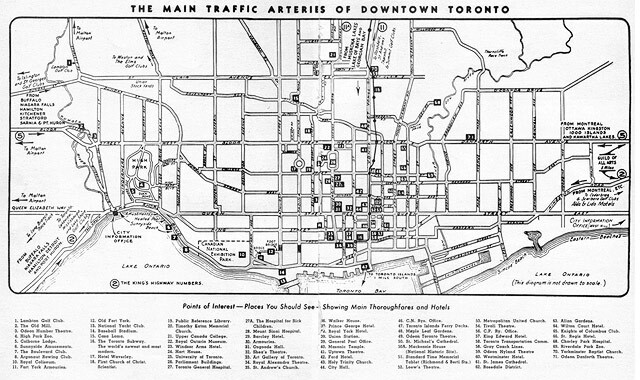 Following greetings from Metropolitan Toronto Chairman Frederick Gardiner and Mayor Nathan Phillips, the guide provides a heavily illustrated selection of noteworthy events and sites around town. 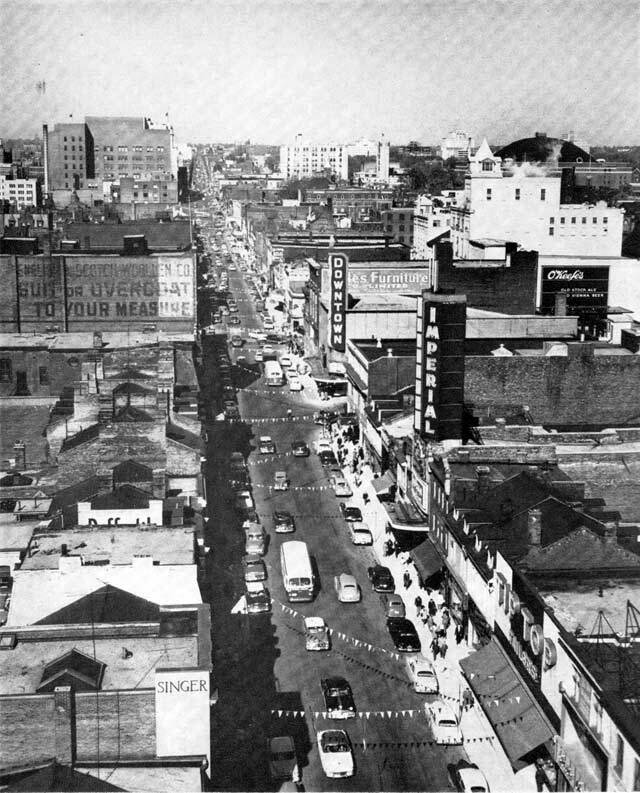 The cover features a northward view along University Avenue, with Richmond Street along the bottom. Pre-9/11, the United States Consulate on University Avenue seems bare without its concrete barriers and security precautions. Continuing north, the newest attraction at the Royal Ontario Museum was a presentation of the story of creation in the geology gallery (seen above on the right; the Ming Tomb is on the left). Access was far more affordable than now: free, except on Wednesdays and Fridays when it cost a quarter to get in. Break time! Care for shopping and entertainment along Yonge Street near Dundas Street? For those looking for modern touchstones, the Imperial is now the Canon Theatre, while the southwest corner of Yonge-Dundas Square occupies the site of the Downtown. 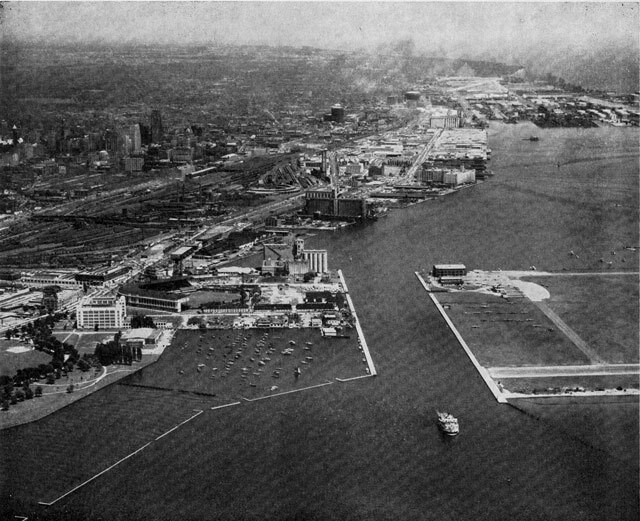 A view of the western harbour, featuring sites still around (the Tip Top factory, the Island airport) and long demolished (Maple Leaf Stadium). Absent, but not for much longer, is the Gardiner Expressway: the section between the Humber and Jameson Avenue opened the following year and was extended to York Street by 1962. Quick, name the first ongoing Shakespearian festival in Canada. Stratford? Nope. Try the yearly selections of the Bard’s works staged outdoors on the grounds of Trinity College, presented by Earle Grey and his wife Mary Godwin. 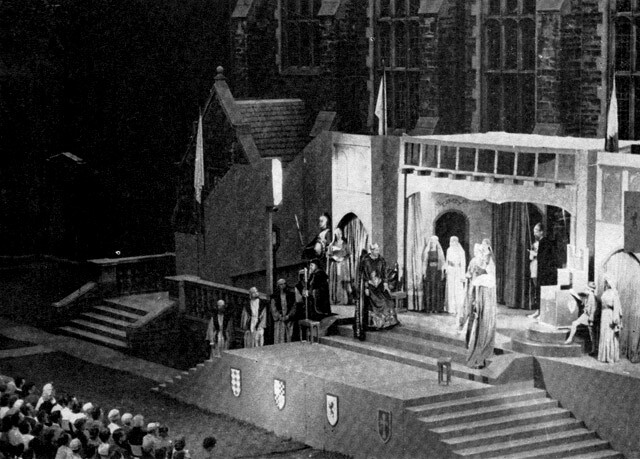 Actor/director/producer Grey staged his first production (Twelfth Night) at what is now the north end of the quadrangle at Trinity in 1946. The festival officially began three years later and featured a mix of experienced British actors and rising local talent—among the Grey company’s alumni were Timothy Findley, Lorne Greene, Don Harron, and William Hutt. The magazine notes that “it is a joyous and unforgettable experience to pass an evening watching one of these great plays being performed under a starlit sky, while a sly moon peeps over tower or turret.” Grey’s slate for 1957 included The Tempest (whose opening night was marred by rain and faulty lighting in the backup venue), The Taming of the Shrew, and Hamlet. Despite the higher prestige of the Stratford Festival, Grey’s festival appeared to have a promising future. The following year, funding was secured via grants from the city, province, Canada Council, and the Atkinson Foundation, and a new three-level stage was constructed on the west side of the quad. The promise of productions to come didn’t last long—following the death of Trinity College rector and longtime supporter R.S.K. Seeley, his successor declined further use of the site for productions. After an unsuccessful search for a new site, Grey and Godwin returned to their native England. At no former period in its history has Toronto witnessed such rapid development as at present. The central area is undergoing great changes, old office buildings are giving place to large modern structures, commercial buildings are moving out to the suburbs or are undergoing “face lifting”; family residences, with their lovely gardens, places of gracious living in Victorian days, are being replaced by apartment blocks of strange design—the city is changing with the times. 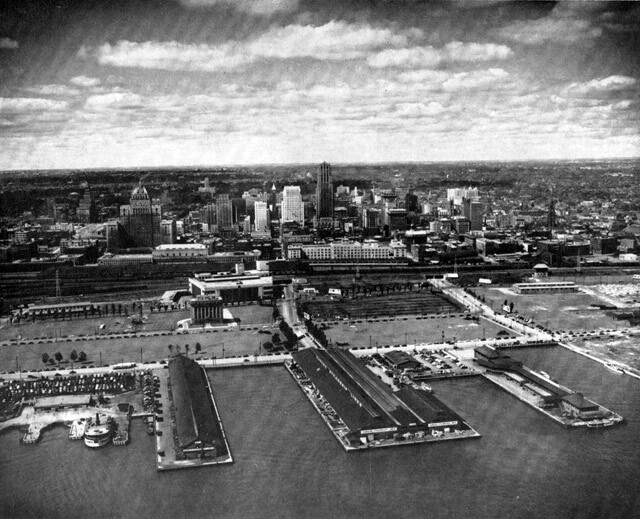 Other developments planned include the following: the creation of a large civic square, adjacent to the present city hall, to be flanked with a large modern civic building, court house and other public buildings; an up-to-date civic auditorium at the corner of Yonge and Front Streets; completion of the Regent Park Housing development providing 1,289 units of modern sanitary housing; the extension of Eglinton Avenue East to connect with Scarboro Township; an extension of the present subway on the line of Bloor Street; an expressway across the southern part of the city near the lake front; diagonal highways to connect with the north-eastern and north-western areas of the city…in addition, the opening up of the St. Lawrence Seaway to permit the entrance of ocean-going ships to the upper lakes will greatly increase shipping and call for the enlargement of the Port of Toronto. Additional material from the Summer 2005 edition of Trinity Magazine and the February 21, 1956 edition of the Toronto Star. All illustrations derived from Toronto Illustrated.